See therapists in Orlando, FL. 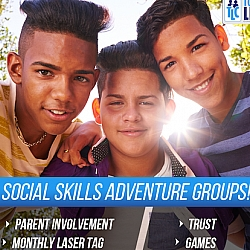 Total Life Counseling offers several groups for individuals with problems interacting and identifying with their peers and is for ADHD, ADD, Aspergers, High Functioning Autism, Pervasive Developmental Disorder and other kids that need help catching up socially! These groups are wonderful for both students and young adults who have social delays, and personal fears. Whatever the reason, our groups offer many benefits and will help you or your student develop the skills necessary for social development. Being around others with the same concerns helps to build friendships, support systems, and reassurances to help you overcome whatever it is you are dealing with. Please call the office for more information on how to be involved in our social skills groups. NON-TLC Clients need screening before joining the group. $48.00 per group session, but if you buy a $120 package for 4 consecutive weeks, each session is only $30. This includes the laser tag ($12 game not included) and pizza week.